Referee. Born in Miami, he was considered by many to be one of the best hockey referees in the province. 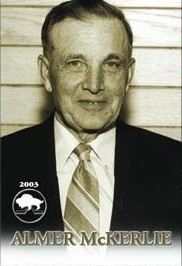 Almer McKerlie officiated for some 40 years in Manitoba handling minor, junior, intermediate and senior hockey leagues. He was Referee-in-chief of the South Eastern Region, South Central, Pembina Valley and junior B hockey. Almer McKerlie also played baseball for the Carman Goldeyes of the ManDak League.